Wax is a wonderful medium to work in and it is my passion as an Encaustic artist to create pictures using this versatile medium. Following on from the launch last month of the new Art In Wax Sunflower exhibition, a collection of 6 paintings all painted in hot wax. Adrian and I created a video diary of me painting some of the pictures in this new collection of A4 sized pictures and a short demonstration of a smaller postcard size sunflower to accompany the exhibit, these are now live on the Art In Wax Youtube channel. 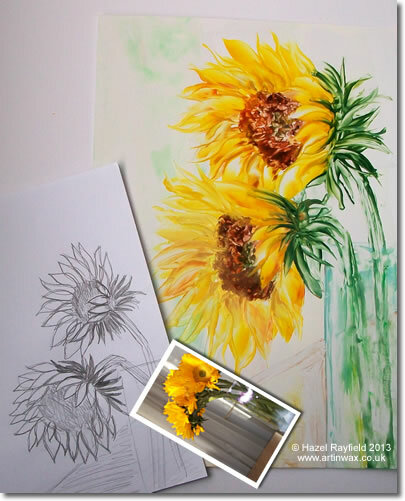 In addition we have now created a further film of me painting another postcard size Sunflower. This film is more close up and gives a more detailed view of the technique of working with the heated stylus tool. Stylus Tool with the mirco nib. Stylus Tool with a metal brush nib. A limited palette of 4 coloured Encaustic wax blocks : Green, Yellow, Orange and Brown. The demonstration can be viewed below or via the Art In Wax Youtube channel How to paint a sunflower. If you would like to, please leave me a comment to let me know if you watched the film and what you thought. 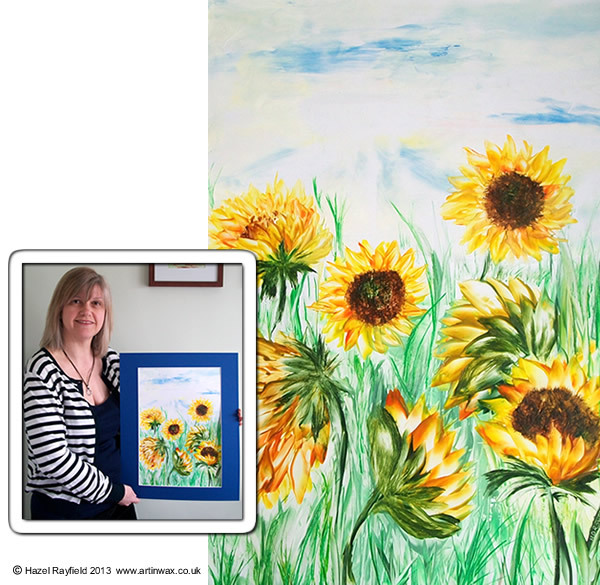 I have painted Sunflowers over the past year several times, they are a favourite flower of mine, I love the way they are tall and majestic, standing proud in gardens and fields. This is a new painting, created over the last weekend, where as in the past some of my paintings have taken me no time at all, I now take time over them and can spend several hours on a piece like this taking me over a few days to complete. 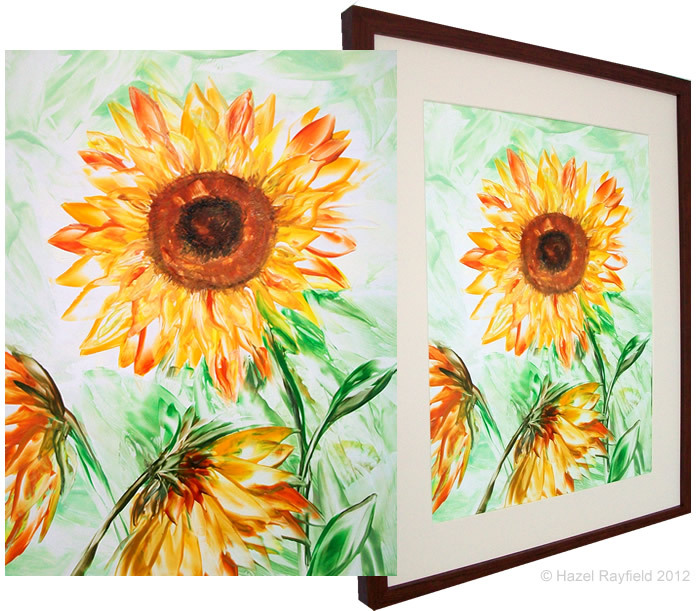 The sunflowers have been painted using a limited palette of orange, yellow and brown waxes, with some white and black for the highlights and centre. The encaustic iron was the main tool used in creating the picture with some stylus work for the detailing as this is a larger piece at 16 x 12. Many of the paintings on the Art In Wax are for sale, please contact me for details if you see a painting you are interested it buying.